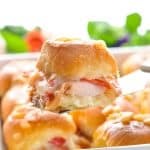 Kentucky Hot Brown Sliders are a perfect Kentucky Derby party food or easy weeknight dinner! Assemble one slider by spreading mayonnaise on the bottom of the roll. Add a layer of turkey, then bacon (breaking it in half or thirds to fit on the roll), a few diced pimientos (or tomatoes), half a slice of Gruyere, and a sprinkling of Parmesan cheese. Replace the top. Repeat with remaining rolls to assemble a total of 12 sandwiches. Preheat oven to 350°F (180°C). Bake, covered, 25 minutes. I used Gruyere and Parmesan cheese but any good melting cheese would do if you don't have them on hand. Why not try provolone or sharp white cheddar.